Hawking HWBA54G Accesspoint / repeater kopen? | That's IT! Nieuw, retail verpakt voor een absolute OP=OP bodemprijs. Zeer geschikt om uw WiFi bereik mee uit te breiden (als WiFi-repeater0, maar dan wel vanaf een bestaand bedraad aansluitpunt. Voorzien van afneembare antenne die is te upgraden naar een flinke antenne met veel signaalwinst en een groot bereik! The HWBA54G puts two solutions into one compact unit, saving you time and money. The included Software Setup Wizard lets you change the function of your HWBA54G whenever you wish to adapt to your specific application and changing network environment. In the Wireless Access Point Mode, the HWBA54G allows for any existing wired network to go wireless at blazing 54Mbps speed! Simply attach the Wireless Access Point using the included Ethernet cable to an open port in your router or switch and enjoy high-speed wireless networking. You can also use the Access Point to cover "dead spots" in your existing wireless network by placing the unit in a room that is lacking wireless coverage. 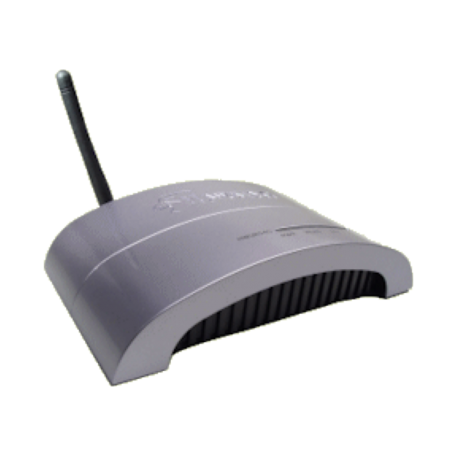 The Wireless Ethernet Bridge Mode enables any wired Ethernet Ready device to connect to your existing wireless network using the HWBA54G. Connect your PC, notebook, printer, network camera or even an entire wired network to the HWBA54G and establish a wireless connection to your wireless network. At home, you can connect your backhouse to the wireless network in your front house without having to run wires across the backyard. In the office you can wirelessly connect your main office network to your warehouse network without having to run long cables across your office floor. The possibilities are endless and the "driver-free" installation is simple.